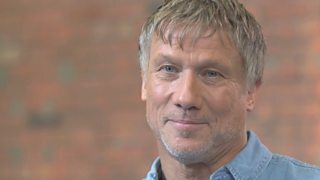 Actor and TV presenter Peter Duncan is probably best known for presenting Blue Peter and his own spin-off show Duncan Dares, a classic children’s TV favourite of the 1980s. Peter joined the Blue Peter team in 1980 alongside Sarah Greene and Simon Groom, he quickly became known for taking on some of the show’s most difficult challenges including running the first London Marathon, cleaning the clock-face of Big Ben and fighting a sumo wrestler. This daredevil attitude led to Peter landing his own series, Duncan Dares in 1985, which made a feature of his action man status. Wearing a beard of bees, walking the hire wire and driving a VW beetle across the Irish Sea were just some the amazing feats he achieved over twelve episodes. Prior to his time as star of 80s children’s TV, Peter was an actor, appearing in the 1980 box office smash Flash Gordon, famously his character Young Treeman met with a grisly end - seeing his hand bitten by an alien critter. Duncan's early acting career was on stage treading the boards at the National Theatre for before playing many leading roles on TV including King Cinder, Space 1999 and Play for Today. After leaving Blue Peter in 1986, Peter returned to the stage in musicals with roles such as Barnum, Bill Snibson in Me and my Girl and as Charlie Chaplin in The Little Tramp. He was nominated for a prestigious Olivier award as Best Actor in a musical for his role in The Card in 1995. He recently played Jack Firebrace in Birdsong and portrayed the Victorian criminal Charlie Peace. In 2001 Peter directed an adventure series called Travel Bug for CBBC in which he and his family backpacked around the world. Since then Peter has managed to combine a TV career (with recent credits including Demolition Dad for Channel Five and Channel 4’s The Games) alongside a continuing passion for the theatre. Staging performances of Erik The Viking, Robin Hood, The Gingerbread Man, Cinderella and Aladdin and many more through his own production company. He was also the leader of the UK’s half a million scouts for which he was awarded a Gold Blue Peter Badge.